The Obama administration is on pace to bring 20,000 Syrian refugees into the United States in FY 2017. The final number of Syrian refugees arriving in the United States this fiscal year will be determined by which candidate–Hillary Clinton or Donald Trump–is inaugurated as president in January 2017. If Hillary Clinton wins, she will be well positioned to accelerate Syrian refugee resettlement in FY 2017 to the 65,000 she has said she wants to come into the country annually. If Donald Trump wins, he has committed to suspending Syrian refugee resettlement. A recent Breitbart/Gravis poll shows that 59 percent of voters oppose Hillary Clinton’s plan to increase Syrian refugee resettlement in the United States. During the first eleven days of October, the first month of the fiscal year, the administration resettled 608 Syrian refugees across the country, according to the State Department interactive website, a rate of more than 55 per day. If that pace continues for the remaining 354 days of FY 2017, a total of 20,075 Syrian refugees will be resettled in the United States during the fiscal year. As a point of comparison, only eleven Syrian refugees were resettled in the United States during the first eleven days of October 2015, one per day. In FY 2016, which ended on September 30, more than 12,500 Syrian refugees arrived in the country. 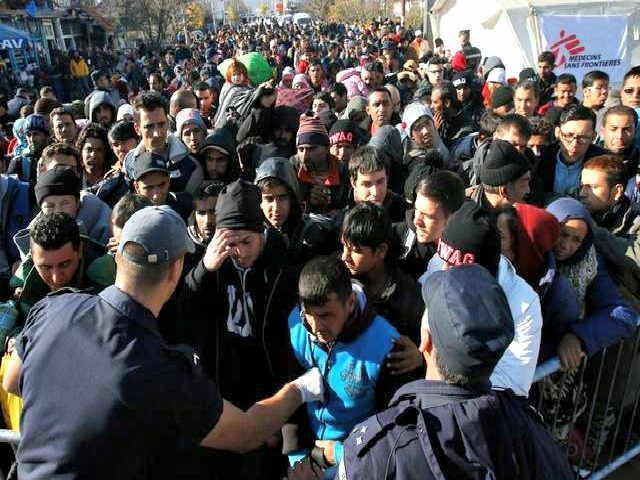 More than 99 percent of these refugees were Muslim. The Obama administration began accelerating the pace of Syrian refugee resettlement in May 2016. During the first seven months of FY 2016, between October 1, 2016 and April 30, 2016, a total of 1,736 Syrian refugees were resettled in the United States, an average of 248 per month. But in the last five months of FY 2016, between May 1, 2016 and September 30, 2016, a total of 10,851 Syrian refugees were resettled in the United States, an average of 2,170 per month. All told, 12, 587 Syrian refugees were resettled in the United States in FY 2016. The pace of resettlement in FY 2017 so far, however, is about the same as the pace of resettlement in the last five months of FY 2016. Syrian refugees arriving in the United States in FY 2017 have not been distributed evenly across the fifty states. Michigan has received by far the most Syrian refugees of any state. Fifteen percent of the 608 Syrian refugees who have arrived during the first eleven days of FY 2017, or 101, have been resettled in Michigan. Sixty-two Syrian refugees were resettled in California, 57 in Texas, 47 in Maryland, 42 in Arizona, 39 in Pennsylvania, 29 in Ohio, 27 in New York, 19 in Georgia, and 18 in Nevada. The remaining 167 were resettled in seventeen other states, a little more than nine per state. Twenty-three states received no resettled Syrian refugees at all. One county alone in Michigan, Oakland County, received 41 refugees, more than 45 states. A second county in Michigan, Macomb County, received 28 refugees, more than 43 states. Oakland County Executive L. Brooks Patterson has said he intends to sue the federal government for its placement of refugees in the county, on the grounds the federal government has failed to comply with the clause of the Refugee Act of 1980 that requires both the federal government and the director of the Office of Refugee Resettlement to consult with the local and state government officials prior to the placement of refugees within their respective jurisdictions. To date, no such consultation has taken place with Oakland County officials. The significant increase in the number of Syrian refugees coming to the United States (up from 2,300 total over the four years between FY 2012 and FY 2015) has been accomplished by an acceleration of the time taken in the “vetting ” process–from a year and half to two years before FY 2016, to the current three months. Critics maintain that there is no way these refugees can be properly vetted from a security perspective. Clinton’s remarks, made in an October 28, 2013, speech to the Jewish United Fund of Metropolitan Chicago’s Vanguard Luncheon, for which she was paid $400,000, according to the Citizen Uprising website, are in stark contrast to the public position she has taken during her current campaign for president. Publicly, however, Clinton has said since 2015 she plans to increase the number of Syrian refugees resettled in the United States to 65,000 annually. If elected president in November, Clinton would face little effective political resistance in accelerating the number of Syrian refugees resettled in the United States in FY 2017 from the current Obama administration pace of 20,000 for the year to her stated goal of 65,000 annually. Local and state governments, however, could still mount legal challenges on failure to comply with the consultation clause of the Refugee Act of 1980, as Oakland County, Michigan anticipates. States that have withdrawn from the federal refugee resettlement program, like Tennessee, also can mount legal challenges on Tenth Amendment grounds.